Does anybody know if pollen harms your paint if it is left on for 7 or 10 days? It has been very windy here in va the last several days And we have a lot of pollen this time of year. We are suppose to get 1 inch of rain tomorrow night into Monday morning. I was going to wait until that was over until I wash. I guess my question is should I spray it off with my pressure washer every 2 or 3 days in between washings. Let it rain on it, lol at pollen under a microscope and you won’t want to touch it! I think there was a discussion about this very subject several years ago. The "conclusion" was that pollen MAY induce micro-marring or very fine scratches in the paint due to the very "pricky" natural structure of the pollen and how it is removed. Under a microscope they look like balls with sharp cones or pyramids (dager-like) on them and if wiped with ,say, just quick-detailer & microfiber or California duster, it MAY cause this micro-marring. I was suggested to WASH it off with low-pressure spray and do a two-bucket wash with a highly lubricated type soap. I would also caution that tree sap is probably a MUCH bigger concern. Here in Wisconsin, locust tree sap will burn and etch your clear-coat if not removed in a short time. However, that is of little immediate concern , as we are dealing with a MAJOR Winter Storm as we speak (or, type). Here in Green Bay, WI we have 8" on the ground and expect another 4-7" tonight thru Sunday. After shoveling for the 2-1/2 hours this morning in my own driveway and another 2 hours this afternoon at the neighbors, I am exhausted and my arms ache. Yes, I have a snow-blower and it was put to good use by my wife in helping me this afternoon. You know it is BAD when a grader with chains get stuck and a large front-end loader comes and pulls it out. There was a four-foot high bank of snow from the plowing at the neighbors across the corner sidewalk apron. THAT took a while to clear and the snow is like cement; very packy. So now I am resting, checking out Autopian forum. My sympathies to you! Hopefully it’ll end sooner and won’t melt so fast it causes problems! Yeah, seems you can`t win. As soon as the snow season is over with the inherent salt and difficulty (especially if you don`t have a heated garage) in keeping your car clean, it`s a very short time before we all are battling pollen. Ah, the winter`s over - mostly - the weather is perfect for doing that spring clean-up on your car, you have all that energy and eagerness to get it looking good. You stand back and admire the result of the day`s effort and smile. 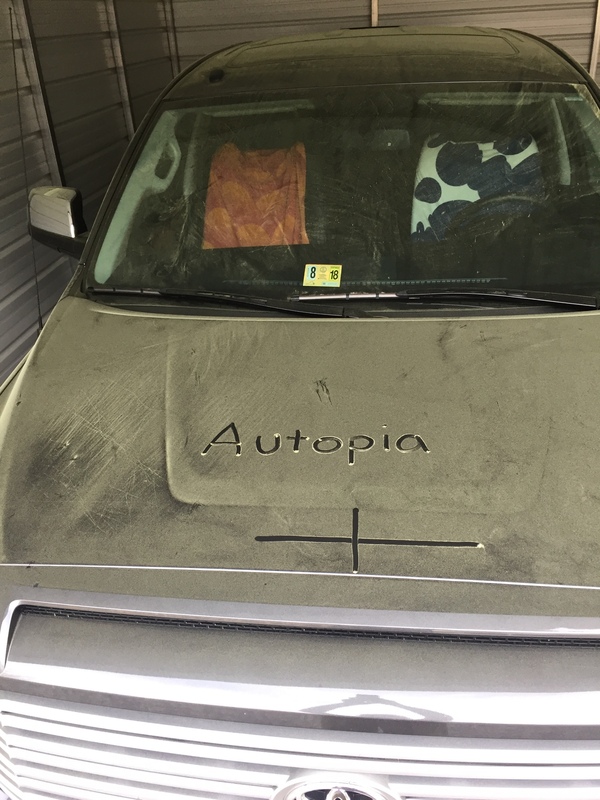 You can now tend to other chores or simply relax and go about your day - or evening, only to find your car coated with pollen. it is probably (a lot) easier to remove your pollen from your car than to remove 13" of snow from the three driveways I will be shoveling or more likely snow blowing. I have not used the snow blower ALL winter. Pollen allergies are nothing to sneeze at (pun intended, and a poor one at that!! ), but I have slight cold-weather asthma, so pick your poison. I have about 3 vehicles lined up to be cleaned/detailed (friends and neighbors) and have not been able to get to them due to this unseasonably very cold and now snowy April and probably will not until next week, as the long range forecast has temps in the 30`s and MAYBE low 40`s by the end of this week. It`s going to take a long time or very warm temps to melt this much snow!! Looks like January Packer playoff at Lambeau Field weather and not mid-April. I know they call it "The Frozen Tundra of Lambeau Field" but this is ridiculous! Northeast Wisconsin has pollen from pine trees that is very yellow and very prevalent here in mid-to-late summer, and yes, vehicles do look like the photo of yours that you posted. I don`t want to know what pollen season is going to be like here in Colorado from all the pines. Pollen can also shear off your LSP. I guess that like bugs and bird-bombs, all pollen situations are potentially different, but such stuff just isn`t an issue for me since switching to the FK1000P, no longer give it any thought. Last year I never bothered doing anything about the pollen on the Tahoe, and with all the dog outings it was "what color is that? "-level bad and the daily glass cleaning was kinda messy. But a few hard rains washed it off well enough that only an Autopian would think it needed a proper wash, and when I finally did wash it there were no issues whatsoever. My wife`s OCW`ed A8 never seems to get much pollen on it, but I wouldn`t bother doing the wash early over it even if it did. Re whether pollen is abrasive, I just don`t know. Plenty of stuff looks all jaggedy/prickly/etc. under magnification, but unless it`s *hard enough to mar autopaint* and has enough pressure applied to it for that to happen, it might still be OK.
Fishroes- Did you get any visible marring from writing in the pollen like that?!? If I touch *any* kind of dust in that manner I do get marring, usually even visible to the naked eye without specialized inspection conditions. Since I have to a house that does not have many trees and few pine trees around, the pollen has been significantly less. I can never complain about our pollen blizzards again after seeing the OP`s picture. I`m a huge fan of rinsing the stuff off REALLY well before hand washing. However since I`ve been using a coating, I notice it doesn`t cling to the paint like it did when I used a sealant. Often driving will blow some off and a good, hard, soaking Spring rain will do wonders to rinse it off as well. I will admit a flash thunderstorm will simply leave the car with yellow dots and tie-die like swirls all over the place. What`s With This Pollen ??? ?